$15 Promotional Gift Card available on this product! Choose the size you normally wear in a men’s shoe. The width is considered “D” or “normal”. I found the boots to fit fine in my normal size. The toe design of these boots is round and the ball area is generous, so if you are sometimes between sizes, you’d probably be OK with the smaller. If you are shopping for a good entry level racing boot that will be comfortable in warm weather, then keep reading! The Latigo Air Road Race boot is the perforated version of Cortech’s Latigo boot line. Like its waterproof and solid leather cousin, it offers all the basic features you’ll need on the track. The boot has solid protectors in the ankle and shin areas (the shin guard is especially sturdy feeling). And there are also stiffeners incorporated into the toe shift area and heel cup. 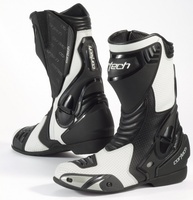 The boots have a definite forward lean to them that those riding race/sport bikes need for easy shifting. And the soles are low profile for the same reason. These are all great features for racing and sport riding, but they’ll hinder “normal” walking some (so I wouldn’t advise buying a race style like this for every day street use). The inside of the boot is very comfortable. They are lined with a lightly padded breathable material that will allow the air to pass through. The boots come with removable inserts in the foot bed which are also very comfortable. Since they are removable, you have the option to replace them if you like. Like most other race boots of this type, they are about 13” tall overall. The boots close with a zipper about 2/3 of the way up and there is a large Velcro closure at the top to allow for some adjustability over the calf area. The boots have a great style, and it seems many people are liking the White/Black version this season. These boots represent a very good value in a race boot. Of course they don’t have all the fancy features of the Sidi and Alpinestar boots, but they aren’t $400 either. Take the “View Larger Images” link above to see some close-up pictures of these boots and their features.